FREE GOLF & MORE! Private Pool, BBQ Grill + Minutes to Old Town Scottsdale, Golf & Giants Stadium! Property 3: FREE GOLF & MORE! Private Pool, BBQ Grill + Minutes to Old Town Scottsdale, Golf & Giants Stadium! Newly Updated Old Town Rental - Best Location in the city! Property 6: Newly Updated Old Town Rental - Best Location in the city! Entertain and Relax as Old Town Scottsdale awaits! Property 13: Entertain and Relax as Old Town Scottsdale awaits! Property 16: NEW LISTING! Comfy home w/a private pool, hot tub, outside entertaining space! NEW LISTING! Spacious house w/pool & enclosed yard - close to golf & more! Property 17: NEW LISTING! Spacious house w/pool & enclosed yard - close to golf & more! Gorgeous 2BR Scottsdale Home w/Heated Pool! Property 21: Gorgeous 2BR Scottsdale Home w/Heated Pool! LUXURIOUSLY QUIET N Scottsdale Western Casita w/Pool, Views, Hiking, Golf, RZR! Property 22: LUXURIOUSLY QUIET N Scottsdale Western Casita w/Pool, Views, Hiking, Golf, RZR! Escape @ McCormick Ranch ~ Pristine 2BR, 2BA Home in Highly Desired Location! Property 23: Escape @ McCormick Ranch ~ Pristine 2BR, 2BA Home in Highly Desired Location! Property 25: NEW LISTING! Mountain view home w/pool & patio-near downtown! Desert Oasis - private home, N Central Sdale, Pet Friendly! Great location! Property 27: Desert Oasis - private home, N Central Sdale, Pet Friendly! Great location! Sleek,Beautifully Furnished,Great Location Scottsdale Pet Friendly! Property 30: Sleek,Beautifully Furnished,Great Location Scottsdale Pet Friendly! Property 36: Scottsdale Kierland home w/Pool, 3 Bdrs, 2 Baths, modern and ready for you! 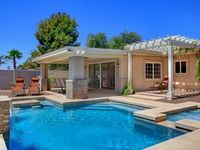 Property 42: Luxury Scottsdale Home - 40% Summer Discount - 2018 CAR INCLUDED WITH RATE! Property 45: Private HEATED Pool + Hot tub. Experience everything Scottsdale has to offer! ESCAPE & RELAX IN OLD TOWN SCOTTSDALE- SLEEPS 14! Property 50: ESCAPE & RELAX IN OLD TOWN SCOTTSDALE- SLEEPS 14! All the houses in Scottsdale. The place was amazing. 6 of us stayed here...plenty of room for all of us. The tv&rsquo;s, pool table, and pool were great for just hanging at the house...but also within walking distance to many restaurants, bars, etc. Will definitely book again in the future.